Proper fall prevention techniques are a must on both residential and commercial roofing jobs. Failure to use safety equipment can result in costly OSHA sanctions, damage to your reputation, and even unthinkable accidents. Prepare and prevent falls by using affordable safety equipment by the Roofing industry pros at Cleasby. The Complete Warning Line System W00050 covers all your bases, and allows you to provide a safe working environment for your crews on any rooftop. With the W00050 Complete Warning Line System, workers are able to complete job site tasks with the safeguard in place warning them that they are near to the roofs’ edge. The full system includes the 4 stanchions, 4 bases and 100 feet of pennants. The stanchions included in this Warning Line System are made from strong pipes that have slip fit connectors that allow you to easily insert the pipe into the base plates. Base plates are large and sturdy, measuring 24 inches by 24 inches by ¼ inch. 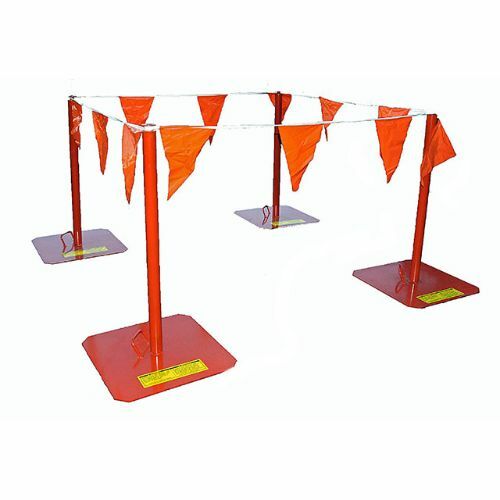 The pennants that drape from stanchion to stanchion are made from a reinforced material to prevent accidental rips and tears in a rugged work site environment, and with over 100 feet – Crews can set up multiple ways to best suit each unique job site. In addition to the W00050 Complete Warning Line System, Cleasby also provides additional separate stanchions, bases and pennant lines for purchase to expand your perimeter system. An alternative Collapsible Perimeter Warning Line System is also available, offering even easier storage and transport. Make fall prevention and overall safety a priority on each and everyone of your roofing jobs. Doing so could prevent injuries, and also allows your crews to focus on the job ahead. To view all the safety equipment Cleasby has to offer, visit the Intech Equipment and Supply Online Store. To place your order for the Complete Warning Line System, give our experts a call today!